Along with the movement Humans of New York, a project to share the stories of New Yorkers, Humans of San Antonio is part of the Global Humans Project, a network of major cities around the world dedicated to capturing a glimpse into the lives of the everyday citizen. From Amsterdam to India to Rio de Janeiro, San Antonio joins the ranks of cities photographed and shown through social media to the rest of the world. Michael Cirlos is the photojournalist behind Humans of San Antonio, a social media project founded in 2012 that combines photography and storytelling to promote the spirit of San Antonio's growing downtown community. 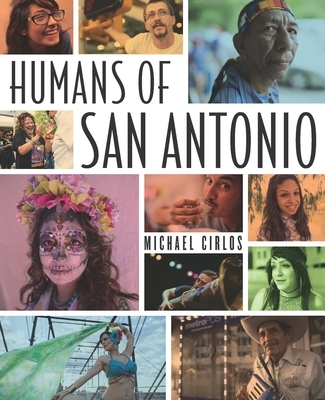 Humans of San Antonio, the book, is the culmination of more than four years of photographs that highlight the people, culture, and vibrancy of San Antonio. As a community that has weathered economic imbalance and proven itself a leader in urban redevelopment and 21-century innovation, San Antonio embraces change while continuing to celebrate the diversity, history, and individuality that makes it so completely unique. This book reflects the the city's heart and symbolizes the importance of the people who make up its melting pot of cultures. Each photograph tells the story of a citizen of downtown, and through images and his subject's own stories, Michael is able to communicate not just the human vulnerability to fear, sadness, and anger but also its resilience, strength, hope, tolerance, and perseverance. Humans of San Antonio is at once uniquely individual as a photography collection while celebrating the international collaborative that forms its roots. Each personal history maps out the family, friends, and neighbors that populate a lifetime and encourages the reader to explore San Antonio's cultural differences by showcasing the diversity it honors. Michael Cirlos's passion for photography developed in 2006 when he relocated to Hua Hin, Thailand, to study international relations at Webster University. After two years studying and exploring Southeast Asia, he was awarded the travel scholarship to continue his education and photography in Amsterdam. He returned to San Antonio in 2009. After graduating from the University of Texas at San Antonio, he began reporting on inner city culture and founded Humans of San Antonio. His work has appeared in regionally on Kens 5 and Univision 41 and in the San Antonio Express News, the Rivard Report, the Lake Front, Muze Collective Magazine, Centro San Antonio, and San Antonio Magazine. In 2015 he was selected to participate in the Mountain Workshops School of Photojournalism, where he studied under Rick Loomis, a Pulitzer prize-winning photojournalist of the Los Angeles Times.